New Orleans. It speaks to us of Mardi Gras, Creole, the French Quarter, history, fine cuisine, music and the Saints. Riverboats and the Mississippi. Fun people, trolleys and carriage rides. And a plethora of other enjoyments in the Queen City. So many things to do but we don’t always have the time or the money for everything even a quick two or three-day visit. So let me suggest to you six and a half things to chose from when perhaps the dollars are stretched and the time is lacking. First I suggest getting on the Hop on Hop Off bus to catch the major sites and neighborhoods in the city and a lay of the land. Passes for one to three days are available. Riding the bus on a narrated tour plus the option of getting on and off without having to move a car or walk from location to location is great. It also gives you an “geographic itinerary” mindset of how to spend your time. Many of the major sites in New Orleans are offered by the bus route. Reaching a bus pickup or drop off area is quite easy to as there are many on the route throughout the city. One of the stops on the Hop on Hop Off bus route is Jackson Square or the Place d’Armes as the early French settlers called it, magnificent St. Louis Cathedral, the Louisiana State Museums (The Cabildo and the Presbytere) all incredible architectural gems and open to the public for visiting and prayer if you so desire and it’s all right on the Mississippi River. 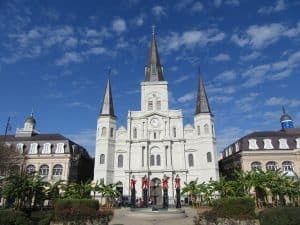 An area teeming with people, music and the center of many activities, Jackson Square is named after President Andrew Jackson the hero of the Battle of New Orleans in 1814 during the tail end of the War of 1812. Located across from Jackson Square is the Washington Artillery Overlook fronting the Mississippi on one side and the St. Louis Cathedral on the other giving one the opportunity to take photos in a “can’t miss” location for memories. Here is the world-famous Cafe Du Monde and my third stop suggestion. 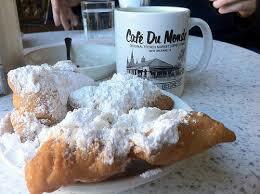 Ever had a beignet or covered yourself with a shower of white powdered sugar? It’s worth it while enjoying one of the best bakery items you can imagine. Pair this with a cup of their famous and delicious New Orleans Chicory coffee. Cafe Du Monde is also a highly organized mob scene opportunity. Enjoy the efficient but not friendly hustle of the servers, confused tourists and all accompanied by really cool talented street musicians and yes they do play “When the Saints Go Marching In “occasionally! There is a window for takeout so you can sit in the park with a better view. Decatur Street artists and more. Nothing beats taking a ride on a streetcar in New Orleans. The oldest and most revered is The St. Charles Line. It’s all aboard this dark green trolley for a trip into New Orleans’ past on the oldest continuously operating streetcar in the world! The mahogany seats, brass fittings, and exposed ceiling light bulbs are all from a day when plastic seats and aluminum rails were not even a thought. 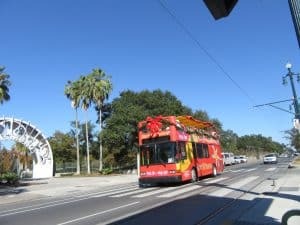 Rumbling around the ”neutral ground” of St. Charles Avenue and Carrollton Avenue for more than 150 years, the streetcar symbolizes the charm and romance of the City of New Orleans. This route traditionally forms a 13.2-mile crescent from Carondelet at Canal Street in the Central Business District through the oldest and most majestic section of uptown New Orleans, around the Riverbend to Carrollton at Claiborne Avenue. Swaying along St. Charles Avenue through a tunnel of Live Oaks, we passed dozens of antebellum mansions, historic monuments, Loyola and Tulane universities, the sweeping grounds of the Audubon Zoological Gardens, shopping centers, fine restaurants, and hotels. 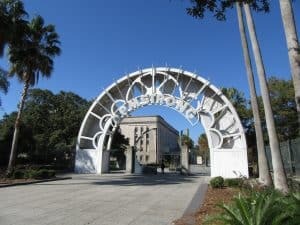 In a city famous for its musical traditions, perhaps no other single location claims as much musical and cultural history and importance as Louis Armstrong Park. 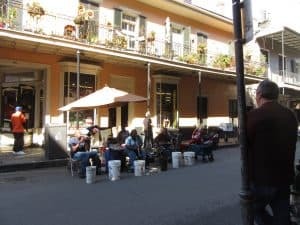 Located at 701 N. Rampart Street on the edge of the French Quarter, the park is dedicated to one of the City’s most celebrated native sons and to the tradition of jazz in the City. The park is located on a main trolley line in the “urbanizing” Tremé neighborhood, the birthplace of many of New Orleans’ most famous jazz musicians. The National Park Service has an active presence in the park. 6. Strolling the French Quarters streets. Take a leisurely walk down any street running from Canal through the French Quarter, about 12 blocks. 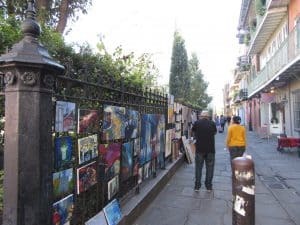 Decatur takes you by Jackson Square and the markets with lots of shops, street musicians and artists. Then come back on Chartres, Bourbon or Royal. If you still have the strength and time do another one, there is no end to the shopping and sites. Easy to stroll and do great shopping in New Orleans. Street art in New Orleans French Quarter. Here you’ll also find the legendary restaurants like Brennan’s, Two Sisters and Antoine’s. Famous bars and music venues are everywhere. 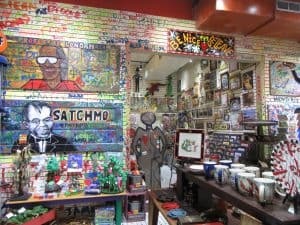 Then there are art and antique shops, souvenir, voodoo and more. Even a shopper like myself got dazed after a few hours. Street artists love to engage the public if you have inquiries or thoughts to share. Of course, buying a piece or two never hurt anyone! Free to look! 6-½. Cafe Du Monde Again! Why not experience a good thing twice with a great cup of coffee and a beignet or three to wind down from a great day in a fascinating city!